Monday again. Both parties had early evening plans and it was decided to keep the walk reasonably short. The weather when I left my home was misty/foggy and remained so almost to Newgale, when lo and behold it cleared. 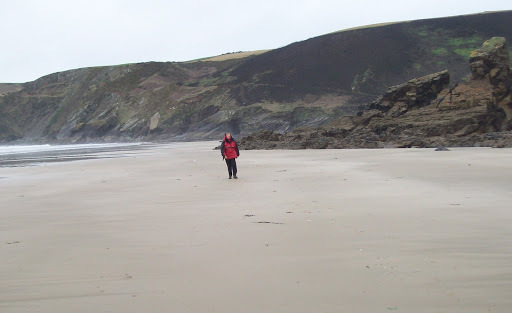 Our plan was to leave the car in Newgale and catch the bus (three cheers for bus passes) to Solva. On the camping ground in Newgale we saw a flock of oyster catchers performing what seemed to be a dance on the wet grass. The considered opinion was that they were trying to attract worms to come to the surface. 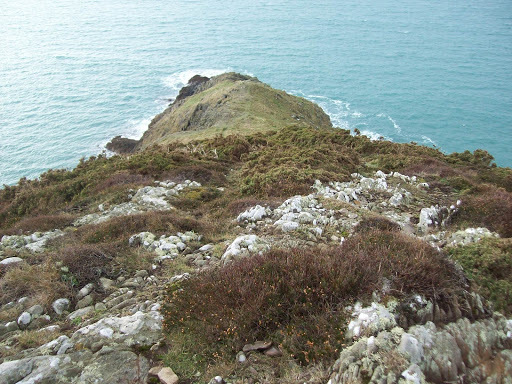 At Solva we climbed out of the harbour and up onto the headland known as the Gribbin. 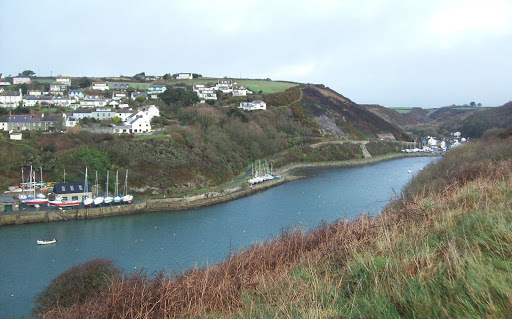 I have had many a family holiday based in Solva and it was here quite some years ago my interest in canoeing started. 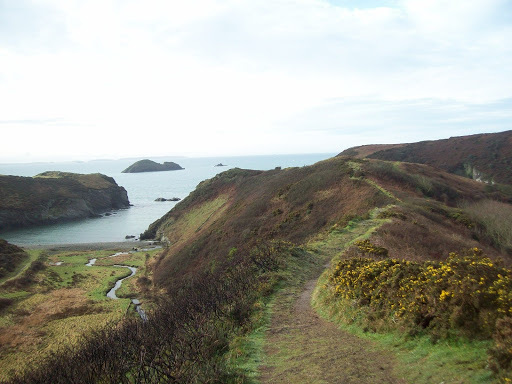 It was a bit early for elevenses and so we walked on to the next headland at Penrhyn. 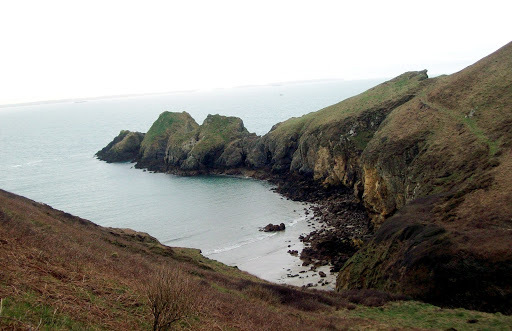 We walked on admiring all the sea views and rock formations which abound on this coast. 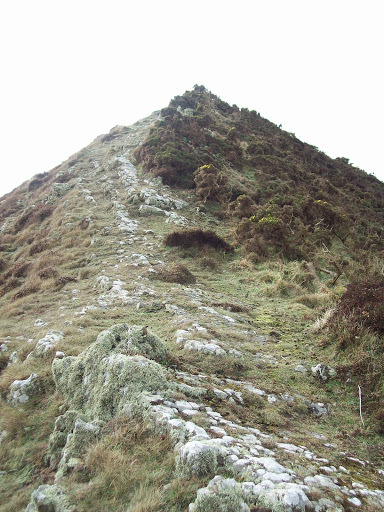 We deviated from the path proper to walk on the headland known as Dinas Fawr. 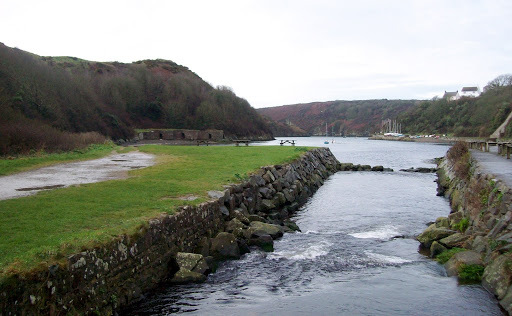 What a lovely place, almost arete like and any slip would have resulted in the activity known as coasteering! We had lunch between Dinas Fawr and Dinas Fach. 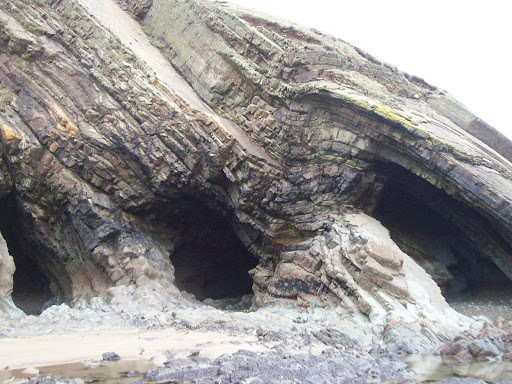 The latter looked interesting to explore but it would have to wait for another day. As we approached the northern end of Newgale beach we looked down into a small bay and spotted a sheep lying down on the sand. Two of her friends were looking down from a precarious ledge. It was difficult to see how the sheep had got to the beach and as it had not moved we assumed it was injured. A friend of mine is an inspector with the RSPCA and I called him for advice. he could not help as he was on his way to rescue a dolphin! However he gave me a phone number to call at HQ. To cut a long phone call short the RSPCA do not have the facility to accept grid references but need a post code! The person I spoke to was also unable to locate Newgale or Haverfordwest and seemed uncertain as to where Pembrokeshire was! I was now low on credit. When I arrived home the RSPCA had contacted the local animal health people in the council, they had been to the scene only to find no stranded sheep but one making its way back up the rocks! 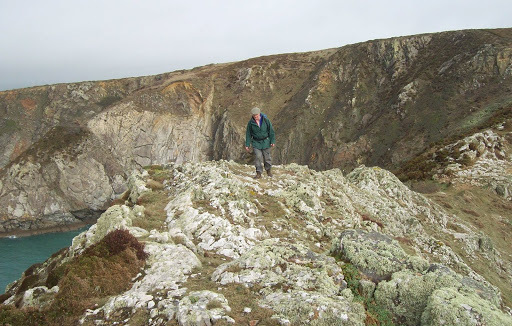 How can a national rescue service not have access to grid references – hopefully dear reader you will ensure that your next walk will include all relevant postal codes. I feel a letter coming on. 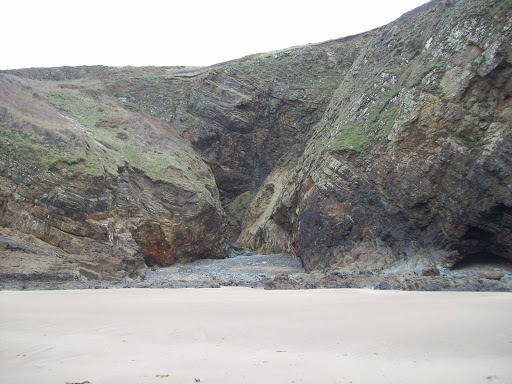 Our walk continued on the beach at Newgale with the cliffs showing the power of nature and the possible lair of the Welsh dragon. Back at the car and the rain started how lucky were we?